Flexipole Industries has refined traditional post and rail fencing with user friendly, smoothed and rounded edges. Completely maintenance free, this innovative post and rail fencing has been specifically designed to withstand Australian conditions. Much stronger than ordinary timber, there is no splitting or splintering to cause injury to people or animals. 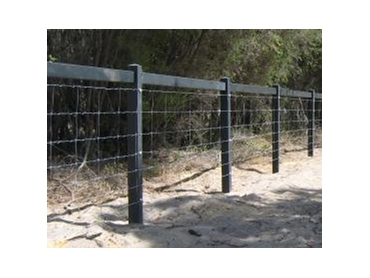 The hard finish that characterises Flexipole’s post and rail fencing deters chewing and crib-biting in horses. There are a number of possibilities available, from quadruple rails to top rail only with wire. The Flexipoles Fencing Systems are recyclable and repairable and the materials used are food safe.